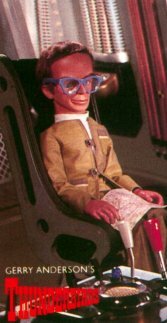 Knowing that International Rescue would need a mind of super ability, Jeff found teenage Hiram K. Hackenbacker in Paris, nervously delivering a lecture in a culture hall. Brains, as he is known to everyone, was orphaned at a young age and adopted by a Cambridge University Professor who recognised the boy's genius and encouraged his education. 25 year old Brains has brain power and inventive genius beyond his age. As the inventor of all the machines used by the organisation, he is never satisfied with what he produces and is constantly working on modifications to his creations.